La Mamounia no one can leave this city without at least taking a tea in the grounds of this majestic hotel. Who can be pure indulgence eating or dining at one of most glamorous hotels in the word. “The walls surrounding the site, belonging to the caliph Abd al-Mumin, the first Almohad century from the twelfth. In the eighteenth century, what is now La Mamounia is a garden backed the ramparts of the old town, belonging to the Alawite Sultan Sidi Mohammed ben Abdallah and his wife Lala Fatima. He designed the gardens for his son Prince Mamoun, and offers her as a wedding gift. The name “el Mamoun Arsal” is then given by the prince1, name becomes “Arsat Mamounia”. An efficient irrigation system is present. The first building, which will be followed by several others, the Mamounia Pavillon, later called the “Palace of La Mamounia,” appears in the nineteenth century but it is destroyed about 1922. But the idea of ​​a grand hotel germ 1920. The following year, Albert Laprade signs the first plans for the future construction, followed by a second designed by Robert Hare; both projects are unsuccessful. In 1923, the architects Prost and E. Marchisio direct the hotel’s early work and his fifty rooms on one floor, on behalf of the National Railways Office (ONCF), the prime contractor. Jacques Majorelle decorates the salon that bears his name. Andre Prost, in 1923 also created the urban structure of the then “new city”, called Gueliz, next to the medina. 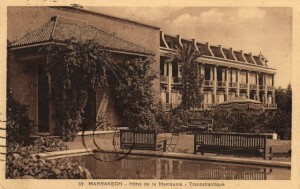 In 1925, the hotel, with a sober, modern decor, and occupying a central building with unique wing named “Wing Koutoubia” opens. 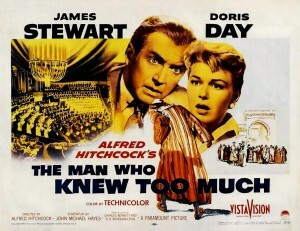 Scenes of The Man Who Knew Too Much of Hitchcock tourn are there. Erich von Stroheim there comes trails. By the 1956, the hotel is used more regularly for movie shoots. 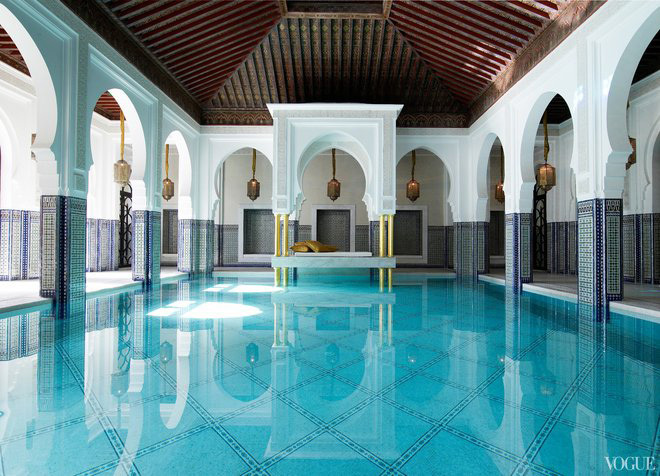 On the impetus of King Hassan II, initially in 1977, a first renovation was carried out in nine months by the young Moroccan architect Lazrak Aziz and French designer Jean-Louis Chollet who works alongside him. Fourteen years later, this is Alberto Pinto who undertakes a new rénovation; since the end of World War II, during which time the hotel doubles the number of its rooms to reach the number of 100 and is seen provided with a second wing, this is the fifth Mamounia renovation that account. 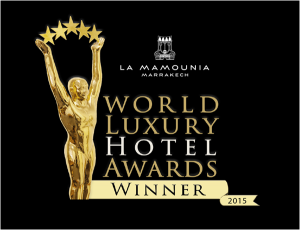 La Mamounia receives (2015) the “World Travel Award”: “ Best Hotel in the World” After being voted Best Hotel in the World by Conde Nast Traveller UK in September 2015, La Mamounia is pleased to announce that it has been named Best Hotel in the World by the prestigious World Travel Award institution. In 2015 celebrates 90 years ! !